CoolTUBE® | MH&W International Corp.
MH&W International Corporation presents CoolTUBE® Radiated Emissions Absorber for the highest reliability and longevity of your VFD motor system! Variable Frequency Drives (VFD) create Electromagnetic Interference (EMI), conducted and radiated, in VFD motor systems. Without the use of some type of filter or choke system, related failures will occur. Unique to the industry, CoolTUBE® absorbs this high frequency noise before it gets to the motor system and causes damage. By acting as a common mode choke and absorbing the damaging high frequency noise (frequencies from approximately 5MHZ-1GHz), you can maximize equipment reliability, reduce maintenance costs, and avoid unscheduled downtime. CoolTUBE® mitigates radiated EMI issues in all VFD motors including servo and DC motors. CoolTUBE® Nanocrystalline absorbers are superior to other soft magnetic materials like ferrites because of significant advantages concerning their magnetic properties. Therefore, only about 20% of ‘magnetic mass’ is required. 1 – Data above is for information/guideline purposes. 2 – All cables/phases must travel through the CoolTUBE® cores. No ground or shielding through cores! 3 – One CoolTUBE® per 150 feet. 4 – It is important to use the correct number and type of each CoolTUBE®. 5 – Install cores on load side of drive for typical motor applications. 6 – Please call CoolTUBE® Engineering for more information. * For cable runs over 900ft, contact CoolTUBE® Engineering. What is CoolTUBE® Radiated Emissions Absorber? In the given configuration CoolTUBE® soft magnetic cores work as a single turn common mode suppression choke. They do not affect the symmetrical power currents but efficiently dampen the asymmetrical radio frequency noise currents. Nanocrystalline absorbers are superior to other soft magnetic materials like ferrites because of significant advantages concerning their magnetic properties. Therefore, only about 20% of magnetic mass is required – i.e. a significantly reduced number of cores is suitable. Electromagnetic Interference, simply known as EMI, is a disturbance in the radio frequency spectrum that affects fields even if their frequencies are not aligned. This is because electromagnetic radiation can still interfere with each other even if they are not on the same frequency, and this is exacerbated by the fact that devices emitting electromagnetic waves tend to also transmit at lower power on harmonic side bands, which is why an FM radio might pick up powerful signals from a nearby CB radio. EMI is a problem on electronic devices since electronic circuits are very susceptible to it because electromagnetic radiation can easily be picked up by any conductor. Therefore, speakers sometimes make noise when a nearby cell phone is receiving a call or text message. This is because the coil in the speakers is acting like an antenna which captures the EMI emitted by the cell phone. EMI can be a serious problem in critical systems that use radios. An airplane, for example, requires electronic devices to be turned off during takeoff and landing, as they might cause interference with communication between the pilot and ground control or other critical systems being used by the plane. For more information on EMI, as well as radiated and conducted emissions, visit the MH&W knowledge center at www.coolblue-mhw.com. No maintenance is required on the cores. Once installed, they last a lifetime, and can even be left on the system if a new motor or drive is installed. Why install the CoolTUBE® cores close to the drive, instead of on the shaft where the discharge is occurring? CoolTUBE® cores absorb the energy caused by the VFD’s at the source before getting on the cable and to the motor. Do CoolTUBE® cores absorb all of the radiated emissions caused by high speed IGBT switching? No. CoolTUBE® cores installed with suggested guidelines absorb the emissions below levels specified by EMI test labs and other governmental agencies. At this level, the emissions are no longer dangerous enough to emit and cause disruption in the system. All electronic devices (telephones, computers, microwave ovens, HVAC equipment, pumps, etc. ), including VFD’s, motors, and even shielded cables are thoroughly tested and confirmed in EMC labs to prevent the devices from affecting the power grid. They are tested to meet standards. The problem with VFD motors and systems is they are not tested together because of the numerous configurations in the field. We in North America see VFD bearing damage and system level devices because North America does not have a strict level of EMI standards for VFD related systems. All electrical devices create emissions/radiations that will interfere with the external environment. These emissions have the potential to interfere with the electrical grid and other local electrical devices. There are two main types of electrical emissions: Conducted emissions and radiated emissions. Can CoolTUBE® cores be used outside? Absolutely. The CoolTUBE® cores are housed in a plastic case, and are not typically affected by outdoor conditions. I have motors that need to be washed down with high pressure water and chemicals. Will this affect operation? No. The great thing about CoolTUBE® cores is that they are not affected by cleaning, because they are not on the motor. The cores are installed at the source, VFD’s, thereby not in the cleaning area. However, in certain circumstances, cores will get wet (water, oil, other contaminants), very hot and dry conditions, etc. This will not affect the cores. Cores themselves can handle well above 600 degrees C, and the case material can handle 140 degrees C.
Do I need to use ceramic type bearings with CoolTUBE®, especially in higher horsepower type motors? Absolutely not, if using CoolBLUE® and NaLA®. 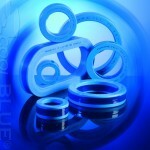 In fact, customers are totally switching over to CoolBLUE® only, and using standard steel bearings. Very simply, CoolTUBE® and CoolBLUE® cores absorb the energy caused by the VFD’s at the source before getting to the motor, so there is no need for ceramic bearings on either end of the shaft! I have one of the best VFD/motor systems on the market. Do I need to worry about electrical discharge occurring? Yes. Electrical discharge will take place, because the currents are caused by the high-speed switching generated from the VFD’s. All drives have the potential of disrupting and causing damage and down time. Will CoolTUBE alleviate bearing fluting and frosting problems? Electrical fluting and frosting occurs when conducted emissions, in the form of high frequency current, is passed through the motor bearing. Conducted emissions are in the range 200kHz, to approximately 5MHz. These currents cause EDM. Radiated emissions start at approximately 5MHz and go up to several gigahertz. These radiated emissions are not connected to anything in the system, rather they are emitted into the air. The affects can be noticed in communication devices such as radios, telephones, and of course if left unprotected, communication links, sensors, and other VFD system related devices. Conducted emissions is electromagnetic energy created by a device and transmitted in the form of an electrical current through its power cord. This can potentially cause problems since power cords are connected to the entire power distribution network. CoolBLUE® and NaLA® absorb conducted emissions. Are there other solutions to eliminate radiated emissions? Yes. Shielded VFD cable, when properly installed will “shield” the emissions from emanating out. However, it only shields and the best solution is to absorb the energy with CoolTUBE®. Shielded cable is considerably higher in cost, and installation can be quite expensive. And, if not completely, properly installed, problems can be worse. Do grounding rings applied to motor shaft eliminate radiated emissions? Absolutely not. Grounding rings attached to motor shafts only exasperate the problem by giving the radiated and conducted emissions a better path to your ground. One method is to place a mechanical ring with fibers contacting the shaft. There are several manufacturers of such rings. In theory, the rings provide an alternate path for these discharges and divert current away from the motor bearings. However, grease, dirt, corrosion, etc. on the shaft will cause the grounding rings to lose contact with the shaft. Maintenance of the mechanical fixture is advisable. Installation is a major endeavor. There are literally hundreds of combinations of motors/motor frames to choose from, therefore, hundreds of products to choose from for rings. Installation of complete centering of the ring, gluing, or boring holes into the motor case, cannot be installed over shaft key, shaft preparation, and much more make installation difficult. And circulating currents are still an issue. Why use high speed switching (IGBT’s) if they cause problems? To reduce cost of equipment, inverters that generate drive pulses (also called carrier signals) use rapid switching causing drive pulses to have rise and fall times to be as short as few nanoseconds, extending the spectrum of these edges to several Megahertz. It is much easier, less ex­pensive, and thermally more efficient to simply turn on and off current to the motor than to create a gradual ramp up and ramp down of the output voltage. Such short edges of drive pulses are the main culprits of the variety of problems. If the connection between a controller and a motor was done as a proper RF connection, i.e. matching input and output impedances, proper RF-grade cable and the like, many of the problems wouldn’t exist. However, the main purpose of a motor is not proper propagation of signal but rather to per­form mechanical work, so there is seldom a consideration for the high-frequency nature of signals. Just like any other choke used in electronics, using CoolTUBE® and CoolBLUE® products solve the EMI problems.